I went to Krispy Kreme yesterday night to wait for my friend before we grab some dinner. If not of the free wifi and a little craving for honey glazed doghnuts, I won't be staying there while waiting. So I ordered two honey glazed doughnuts, then the cashier asked me if I'm getting coffee but I said no 'coz I'm not really much of a coffee drinker. So I said I'll just have water. Well I was assuming service water, but the cashier pointed me the open fridge beside the counter wherein all the drinks were displayed. She told me to just get water from there. So my choices were a medium-sized Viva mineral water or a small Evian mineral water. I chose the smaller one since I can't drink a lot of water. Then I was shocked that my total bill amounted to Php 117. When I was back to my seat, I checked the receipt and it stated that my water costed me Php 55. Yikes, exactly the same price of a small cup of coffee. So it's expensive 'coz it's an imported one. Yikes, I think the local one is cheaper even if it's bigger in size. But it's weird, I wasn't even able to finish up the content of this little bottle so I didn't order a drink during dinner anymore 'coz I brought this water with me. haha! 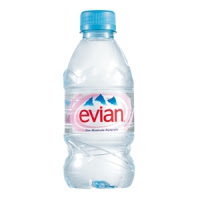 "In popular culture, Evian is portrayed as a high-end and pricey bottled water, making it popular among Hollywood celebrities. David LaChapelle photographed an Evian campaign juxtaposing a supermodel next to an Evian fountain formed from a Greek statue, film actor Sebastian Siegel painted to look like stone by Joanne Gair."